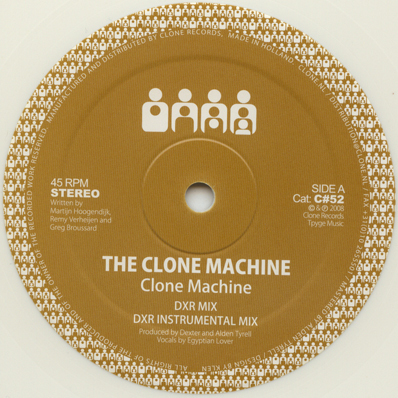 Forming what must be THE electro supergroup, Alden Tyrell, Dexter, Egyptian Lover and Jamie Jupiter present The Clone Machine for Clone records. The original mix is an archetypal West coast electro cut, benefitting from the combined forces involved the styles are set to rocking electro, with purist 808 beats, vocodered vox, and cutting darkside synths with a typical Dexter bassline on his mix, while on the flip Mr Tyrell does his booming 808 workout thing to rock any floor worth it's bassbins. An undeniable electro winner.